1st place winner of the 2009 NASA Astronaut Glove Challenge, Peter Homer, and daughter; Alan Hayes of Volantz, Inc.; Andrew Petro of NASA; 2nd place winner Ted Southern, and team member Amy Miller. An aerospace engineer from Maine, the reigning champion ofNASA's Astronaut Glove Challenge, held onto his title Thursday to win firstprize in a competition to build a better space glove than those worn byastronauts today. 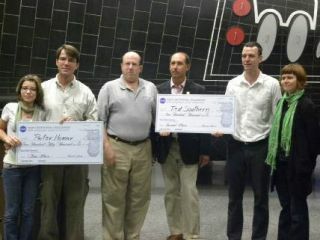 The winner, Peter Homer of Southwest Harbor, Maine, tookhome $250,000, top prize at the competition held at the Astronaut Hall of Famein Titusville, Fla., close to NASA's Kennedy Space Center. It was the second win forHomer, who took home first place, and $200,000, in the first-ever AstronautGlove Challenge in 2007. Second prize this year went to artist Ted Southern, anotherformer competitor from Brooklyn, New York. Southern was awarded $100,000. "It was a close decision. Both met allrequirements," said Andy Petro, manager of NASA's Centennial Challengesprogram, which oversees the competition. The contestwas held to encourage private innovators to attack the issue of astronautgloves, which are difficult to engineer because they must be strong enough toprotect spaceflyers' hands from the vacuum of space, but also dexterous enoughto allow complex movements without fatiguing hands. "We wanted to see if there were any really creativesolutions that hadn?t come up before by opening it up to a broader field of competitors,"Petro told SPACE.com. "Anyone from anywhere can get into it. You're likelyto get a fresh look at the problem." During the competition, teams were required to use theirgloves in a box that simulates the vacuum of space, and also fill the gloveswith water to increase the pressure inside them until they burst, testing thegloves' strength. The gloves had to have both an inner pressurizing layer and anouter thermal protection layer to shield against extreme temperatures andmicrometeoroids, or small space junk. NASA has held a number of Centennial Challenges events thisyear, including a space elevator contest and a lunar lander competition in whichNASA awarded $3.3 million in prizes in total. In October, competitors vied touse robots to digfake moon dirt. The winners received a total $750,000 in prize money. "We have six ongoing multi-year competitions andseveral ended this year with all the prize money being won," Petro toldSPACE.com. "We hope to announce at least one new one this year, and if weget additional funding we'd like to announce several new ones."